Brian Walsh, Jr joined Walsh & Nicholson Financial Group in 2017 after a successful career as a Senior Vice President of Investments at Lincoln Financial Group, covering Northern California and the Pacific Northwest. His professionalism in the financial services business, focuses in wealth management, financial planning, retirement income planning, along with insurance and annuity strategies. 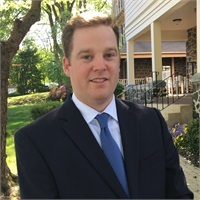 Brian is a Certified Fund Specialist (CFS); holds Series 7,6,63,65, Life, and Health Insurance Licenses; and is currently in the MBA-Finance program at Syracuse University’s Whitman School of Management. He received his undergraduate degree from Cabrini College in Radnor, Pennsylvania. Brian understands that each client has a different set of goals and objectives, which is why Brian takes a holistic approach to Financial Planning. Brian works diligently with his clients to understand their needs to help build a custom financial plan unique to their individual goals. Prior to joining Lincoln Financial Group, Brian was a Police Officer in Prince William County, Virginia. Brian was nominated as squad leader by his peers and led responses to high risk calls and violent crime. He was twice nominated to be Officer of the Month – once for his work tracking down the victim and suspect involved in a kidnapping, and once for assisting a victim of domestic abuse. Brian lives in Wayne, PA with his wife, Lisa, and daughter Ella Reilly.